I was on a local property in central Austin this summer, when I was introduced to a new invader to our town. At first I had no way to identify this vine. No one knew about it, and there were no seedpods or flowers to help identify it. Local inquiries amongst my peers led me nowhere, so I had to do a little extra legwork. 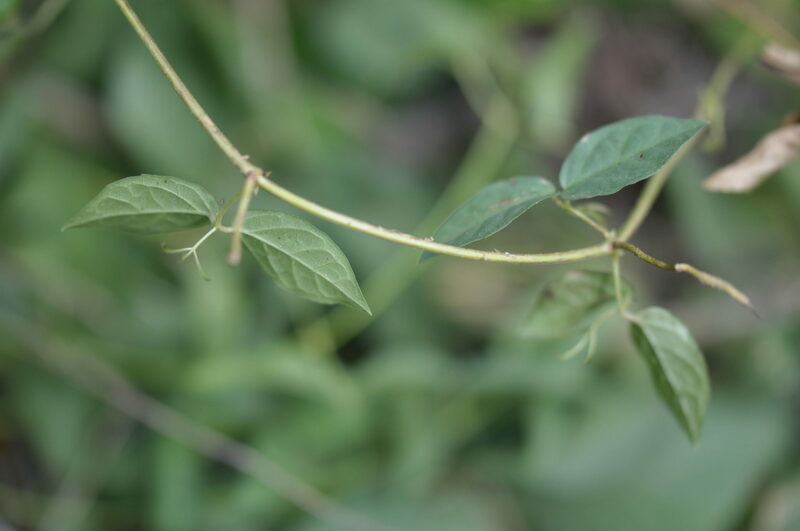 This vine was located on a slope and down into a riparian shady area with a year- round stream. It was located in shady and sunny areas, and was climbing up everything, from shrubs to trees and even a utility pole. It turns out that the vine can be easily identified by looking closely at the three claw-like appendages that stick out from the center rachis in between each pair of oppositely-spaced paired leaflets along the vine itself. This is what gives it the common name of “Cats-claw vine” or “cats claw ivy” ,Macfadyena ungis-cati. Additionally, this South American vine grows large tubers below the ground throughout its root system. These have to be pulled out or the vine will re-grow from these tubers. Other than that, the vine spreads from tubers or from flat seeds that form in very long, glossy green seed pods up to 20 inches long!! These pods turn dark brown at maturity and have very long oblong seeds. The vine will flower in late spring or early summer if conditions are right, forming very large yellow trumpet-like or bell-shaped flowers up to 3 inches long and 4 inches wide! However, this vine does not flower and fruit every year, making identification more difficult for those not familiar with this exotic pest. 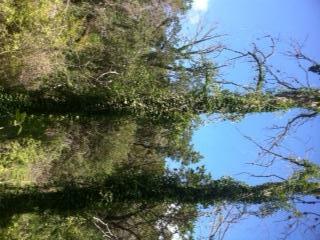 This vine is also hardy to 20 degrees, which means the mild Austin winters will only defoliate it at best most winters. Harsher winters might knock it back to the ground where it can still re-grow. In the US, it has invaded Florida and the southern states, and has now made it to Austin. It is devastating to forests in Australia. There is no chemical control for it, and pulling it out by the roots seems to be the best way to keep it at bay. It can also climb anything, and get up to 50 feet into the air. I have attached pictures to help with identification. If you see this vine on your property, pull it up at once and try to get out the roots and the tubers as well! I was recently on a property in north central Austin, when I was introduced (by the local homeowner) to a remarkable tree phenomenon I have never been exposed to before. As a local arborist who has been practicing since 1993, I though I was aware of most tree related phenomena, at least in the United States. I am surprised to say that I was unaware of these native American “Indian Sign Trees”. The reason I had never been aware of their existence is because there are very few of them in left in the US. Some of the tribes that made them have been gone from the areas the trees are in for over 100 years or more. Native Americans throughout the country bent and marked trees to specific shapes and even made knots on the trunks in some cases. This was done to mark areas, generally springs or water sources close to trails. 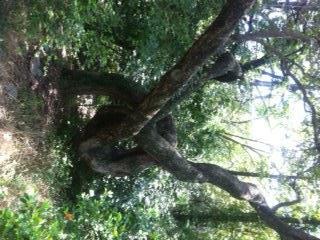 This is a remarkable example of a rare Indian sign tree that is actually bent into a loop! Most trees are bent into a type of zig-zag formation, which must be significantly easier! When the trees are younger, leather thongs were used to tie the young saplings into unnatural shapes. As the trees age and the wood hardens, the trees then retain their shapes as new wood is formed, making the deformations permanent. It’s good to now that a few of these trees are still in the Austin area. If anyone has any other pictures they have take of these amazing local trees, please send them to [email protected] and I’ll post the pictures on this site. Thanks! Since the devastating fires in Bastrop County in September, we have been involved in several fire-related projects in the Bastrop area. The fires devastated large areas of Bastrop County, and left more than 1,500 people homeless. 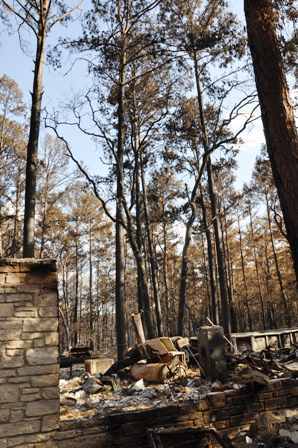 The effects of the Bastrop fires have been considerable. The pine woods, for which the area is well known, have been damaged severely by the intense heat of the flames. Survivability is not certain with respect to the affected areas. The Bastrop pine trees are serotinous (naturally fire resistant), and rely on infrequent fires to clear competition and open cones for regeneration. This is a natural element of the pine forest, and necessary for the long-term health of the forest ecosystem. However, even with the natural fire-resistance associated with the loblolly pines in these areas of Bastrop, the Texas Forest Service is concerned about the stresses associated with the drought, coupled with the extreme heat of the fires. The fires burned so hot, and the pines were so drought-stressed, that we are taking a wait-and see approach to survivability. The trees were already so dry, that even the survivability of the trees in less affected areas is suspect. Pines that were surrounding burning homes were inevitably killed, as were those trees around wood piles, sheds, vehicles or motor homes where the fires also burned much hotter. It has been my recommendation that these trees be removed in order to safely re-build the new homes. Some people have also requested removals around the new structures for fire abatement as well. The hardwoods in these areas typically did not fare as well, and I fear that most of them are dead. They have thinner bark than the loblolly pines, and therefore the cambium is not protected against the heat. Many of the hardwoods I inspected showed no signs of a living cambium. We do recommend, however, that if in doubt you wait until the spring to make a decision. If you have any further questions, contact the Texas Forest Service. I am available for consultations for an hourly fee in the Bastrop area. Construction of an in-ground can have severe and often long-lasting negative effects on trees. To minimize stress and long-term damage, protecting trees before construction begins and continuing throughout the entire process is generally necessary. Although there are many things to consider, we always start with the most important factor: how close are the trees to the pool and where will the crews be entering the yard for the duration of the construction process? Trees need to be a minimum of 2½ times the trunk diameter away from the lip of the pool to be within the threshold of safety with respect to anchoring roots. Trenching can only occur a certain distance from the trunk without not only compromising the overall health of the tree, but also compromising the tree’s ability to hold itself up. Another important factor not always considered is the access to the backyard for the heavy equipment and construction crews. Often crews don’t keep to only one access point, or pick access through wooded areas when other pathways to the back yard are readily available. Compaction to the root zones of existing trees often not associated with the pool itself can occur when moving equipment and crews to and from the back yard. Often, tall backhoes damage trees when moving them into and out of the construction area. Backhoe width, height and access needs to be closely scrutinized with respect to tree limb and trunk damage. If tree limbs need to be removed in order to get the backhoe into the back yard, it should be done before damage occurs. Broken limbs from heavy equipment damage can often cause major wounds to trees that cannot be repaired. Certain native species, such as live oaks, are often more resilient and resistant to construction stress than other species. Knowing this, it is also important to identify the species the pool will surround and the crew is working around and the overall health of the tree(s) in question. 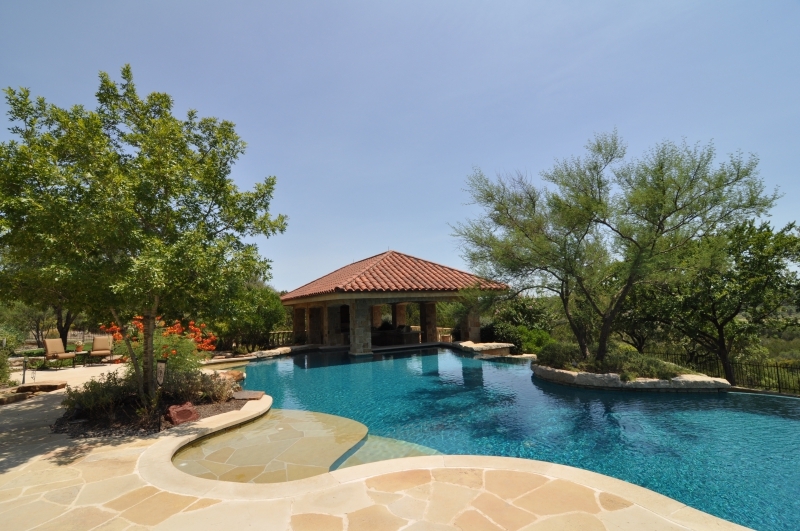 For example, you would probably would not want to build a pool around a large hackberry tree. Hackberry trees are prone to splitting when they are sizeable, are not considered to be very long-lived trees, and can be quite damaging when these heavy limbs fall. Time of year can also be very important when scheduling pool installations. For maximum survivability, often a winter as opposed to a summer pool installation can be the difference between life and death for affected trees. Summer heat stress certainly takes its toll on trees, and when construction compaction and/or root damage is added, it can have disastrous effects. The way roots are severed or cut when trenching occurs is also important. Roots should be cut cleanly. Torn or ripped roots are prone to uneven regeneration and rot. They often do not grow back properly and are significantly more prone to damage from insects and disease. We are often make clean cuts to large exposed woody roots after trenching has been done. Above-ground pools pose different challenges. Some above-ground pools are temporary and some are left up for years. In either case, most above ground pools have a non-porous vinyl bottom which restricts oxygen and has the weight of the water pushing down on the soil below. If tree roots are in the soil under the pool, they can be oxygen deprived and compacted by the weight of the water. We recommend putting the above ground pools as far away from trees as possible. If you have a smaller yard, and want to put up an above ground pool, we recommend putting it in the area of the yard with the least amount of absorbing tree roots. The further from the base of the tree, the less dense the absorbing roots are. Additionally, if you just put the pool up for the hottest summer months and take it down in the fall, the damaged absorbing roots have a chance to regenerate over the fall and spring months, reducing tree stress. Overall there are many things to consider. Deep root fertilization before and after pool construction is generally recommended to help counter the effects of construction stress. It is always better to contact us prior to construction than after irreversible damage has been done. You don’t want the investment you made in a beautiful new pool to be overshadowed by a dead or dying tree! Tell them what you’re going to tell them: Spanish oaks are decreasing in numbers aroundAustin. Why does this matter? In and around greater Austin, Spanish oaks can be found growing, especially on rocky slopes and in greenbelt areas. These trees grow in their natural niche among the ash junipers (cedars), native Texas ash trees, occasional live oaks and cedar elms. What’s especially interesting about these greenbelt areas is that they are, as is typical in all forested areas, extremely dense when unbothered. This state is important to the very survival of the Spanish oak’s efforts to grow on poor, often steep, rocky limestone slopes. Due to erosion and high limestone content, the soils in these areas are extremely shallow causing Spanish oak roots to grow in next to no soil. Central Texas summers are extremely harsh with us experiencing little to no rainfall and often months of temperatures over 100 degrees. As the Spanish oak is fairly drought resistant, the leaves are still quite thin with a fair amount of surface area. The waxy cuticle over the leaf that helps prevent sun scald (sunburn) and water loss is comparatively thin on the Spanish oak leaf compared to other species. Severely drought stressed Spanish oaks get bacterial leaf scorch, the technical term for sunburn, on the leaves, leading to defoliation and death. As we consider heat and drought conditions, it is also important to note how porous the limestone is. So why does this matter? Well, limestone, unless non-porous, which is fairly rare around here (see perched water tables), generally does not retain water. Instead, water permeates through the stone when it rains and whatever does not flow down slopes and off ridges and spurs, where the Spanish oaks are growing, will permeate right through the soil, providing no water retention. During the hottest summer months, by the day after a rain, the soil will often be bone dry the day after a rain, especially in 100+ degree dry heat. Mulch formed by leaf litter and shedding plant parts, which helps ensure healthy roots and soils formation, is often either partially or completely washed away through erosion, further eliminating the possibility of water retention. So how do these trees survive? The short answer is symbiosis. Symbiosis occurs when one plant or animal species benefits another. In the harsh rocky slopes of the Austin greenbelts, Spanish oaks are found in the summer on the ‘edge’ or around the outside of the forested areas, where the natural forested areas end due to neighborhoods, developments, and cleared areas that are dying and defoliating. Why? The answer is actually very simple. In the greenbelts, the trees grow very close together. Although tree and plant roots cross over and compete with each other in very little soil, it is important to note how the densely packed canopies cool the root zones. Evapotranspiration is the technical term for water being pulled through the vascular system and out the holes in the undersides of the leaves (stomates). In simple terms, these stomates open to exchange gasses and to allow a certain amount of water loss to cool the leaves. In very hot conditions, they close to stop this water loss. When tree/plant roots are no longer in these shady greenbelt areas, they are now exposed to the direct heat of the summer sun on the now exposed roots for months at a time. Because they cannot retain any water, and the surface of the thin Spanish oak leaves are comparatively large, they have to put more water through the stomates to cool the leaves enough to prevent sun-scald (bacterial leaf scorch). Subsequently, they defoliate and sections of the tree start to decline. Eventually, this leads to mortality. https://centraltexastreecare.com/wp-content/uploads/2015/06/austin-tree-care1.png 0 0 Andy Johnson https://centraltexastreecare.com/wp-content/uploads/2015/06/austin-tree-care1.png Andy Johnson2012-05-22 16:10:042012-05-22 16:10:04Spanish Oaks in decline? Why does the Austin area lose sycamore trees almost every summer? Sycamores, Platanus occidentalis, are on the list of local Austin trees that are much less drought tolerant. They enjoy cooler, wetter weather, lower temperatures and more water during the summer months. Most healthy sycamores in the Austin area enjoy shaded, mulched root zones, as opposed to exposed roots in the full sun. They also thrive where extra water is applied during the hotter, dryer summer months. Because their leaves are very large, wide, and thin, they require more water through the leaves as a cooling effect to prevent drying out and sun scald. Sycamores are typically found in riparian zones (areas along rivers and streams), along lakes and water bodies, and generally areas with poorer drainage and more long standing water. When sycamores in the Austin area are found along right of ways where water is a limiting factor during summer months, or where the radiant heat from the street exacerbates water loss, stresses typically occur. Heat stress here is exacerbated by lack of mulch to the root zone, and direct summer sun shining on the root zone. Heat stress problems show up as upper defoliation, as the leaves at the top of the tree burn off due to excessive heat at the top of the tree, and then cause the upper limbs to die off as they then dry. This is usually associated with an inability to get enough water to the top of the tree. Then, with no leaves to pull water through the wood and up into the upper sections, the wood simply dries out up there and dies. In extreme cases, the stems can experience cracking and death, and the cambium dies and turns black, which is exposed as the bark breaks off. In these cases, the tree either dies or becomes hazardous and needs to be removed. This is especially true of larger trees. The best thing to do is to plant the trees in areas where they are either on shady streets or back from the street altogether in the center of a shady front yard, preferably not North facing, and preferably in a mulched bed. Extra summer water is also a good idea during the extensive dry summer heat. If sycamores are already in decline due to drought conditions, we recommend watering them and adding a thick 2-3 inch thick mulch layer to the root zone. Monitoring them and maintaining a frequent watering schedule (in keeping with Austin watering laws) is also recommended. Sometimes, simply planting a different species altogether is recommended due to the overall harshness of the planting area. Other factors are can also be a play with declining trees. If you are unsure what is happening to our trees, it is always best to call me out and get a proper diagnosis. https://centraltexastreecare.com/wp-content/uploads/2015/06/austin-tree-care1.png 0 0 Andy Johnson https://centraltexastreecare.com/wp-content/uploads/2015/06/austin-tree-care1.png Andy Johnson2012-05-22 16:09:432012-05-22 16:09:43Are your Sycamores declining?